The notes in a DrumBurp score are arranged into measures. The position of each note in a measure is defined by 2 pieces of information: the drum that it is played on, and the time at which it is played. The second of these – the time – relies on that measure’s count. You can see the count for each measure immediately underneath the notes area. Each measure has a count which has a certain number of beats. Each beat is divided into some number of ticks. For example, a simple count might be ‘1 + 2 + 3 + 4‘, which is 4 beats each of 2 ticks. This corresponds to the way you would count time in 8ths: “1 and 2 and 3 and 4 and”. A measure with this count in DrumBurp will allow you to place notes on the 8ths, but nothing more finely grained. To place notes at other time intervals you will need more, or different, ticks in the beats. Note that each beat takes the same length of time, but the number of sub-divisions of that time corresponds to the number of ticks in the beat. The example above has 4 beats of 4 ticks, counting time in 16ths. If you need different ticks in a measure, just double-click on the count below the notes area. A dialog will pop up allowing you to select a new count for the measure. There are 2 types of count: simple and complex. Each of these allows you to change the count in different ways. If you get lost at any point, the Reset button will restore the count that the measure had when you first opened the window. The Restore Defaults button sets the count for this bar to the value of the score’s default count. 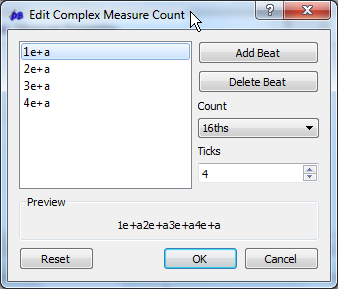 This is the default type of count: each beat in the measure has the same number of ticks. This will be the most common approach that you will use the majority of the time. 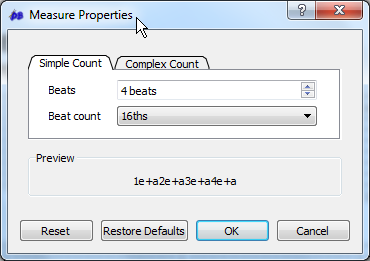 Simply select the number of beats you want in the measure, and how you want each beat sub-divided into ticks. The dialog shows you a preview of the count so you can decide if it is what you want before you select it. Once you click OK, the new count will be applied to the measure you clicked on. Sometimes you just need a little more finesse over how many ticks there are in each beat in a measure. For example, perhaps the groove is in eighths, but the last two beats have a fill in 16ths or triplets. Selecting the Complex Count tab of the dialog will allow you to select the sub-divisions of each beat separately. Click the Edit Count button and the Complex Count Editor will appear. It’s more work than the Simple Count dialog, but it gives you more control. Just select each beat from the list on the left, and choose what ticks you want it to have from the Count drop down box on the right. Add and remove beats using the buttons on the right. Again, the preview window will show you which count your current selection will result in. Note that a complex count can be used to make any of the beats in a measure shorter in duration than the others. You can do this by changing the number of ticks for the beat with the Ticks spinbox on the right hand side of the dialog. It’s rare that you’ll want to do this, but when you do it will normally be to shorten the last beat of the measure: for example, for odd time counts like 7/8 or 9/8. Once you have selected a new count for a measure, DrumBurp will keep any notes in the measure which fit into the new count. Any notes which do not fit will be discarded. Every score has a default count. 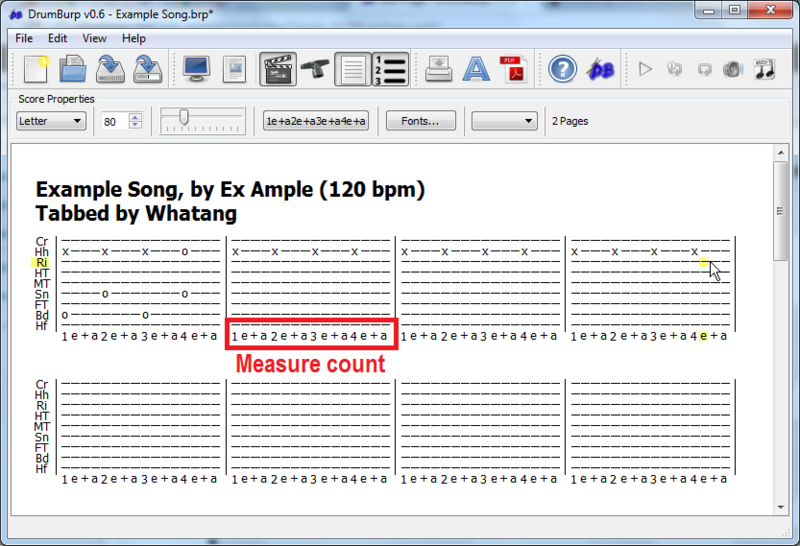 This is the most commonly used count for the measures in the score. It is used to provide a shortcut for adding new measures. The default count is displayed in the toolbar at the top of the score editing window; to change the default count simply click on it. 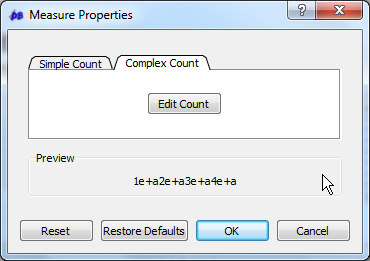 A count dialog will pop up, the same as is used for selecting the count of a measure. Select the desired count and click OK.